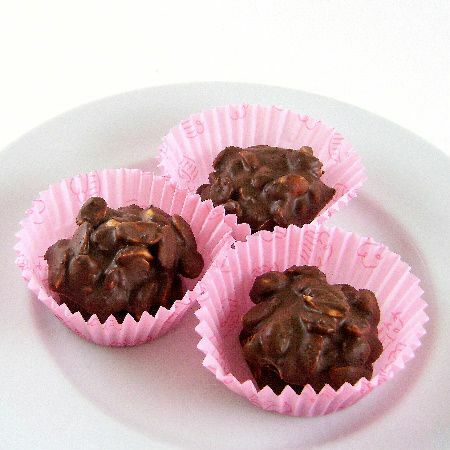 I wanted to include the recipe for peanut clusters in this week's Chocolate Extravaganza, anticipating that some of you might want to make something like this for Valentine's Day. When my children were still quite young, we established a tradition for gift giving. Purchased gifts were, of course, fine, but there was an expectation that each of those gifts would be accompanied by one that was handmade. My children adored Bob's mother, and over the years they made some outrageous and unintentionally humorous gifts for her. My favorite among them was an elaborately decorated cane, that looked for all the world like a totem pole. She had no need for it at the time, but as they explained it, someday she would and in the meantime she could practice. Another of their favorite gifts for her were these peanut clusters which I suspect she liked these a lot more than the cane. I know my children loved to make them for her. The recipe was a simple "cuppa" creation that they really could make by themselves. Unobtrusive supervision was necessary because there's a point when the chocolate could burn small fingers, but once that stage had passed they could truly work on their own. If you decide to have your children make these, brace yourself for a mess. Old clothes, or as few clothes as your sense of modesty dictates, and plastic gloves will help contain the mess, but you'll want to be around to supervise a clean-up that can be smudgy. I'm embarrassed to call this a recipe. It's more an accumulation of stuff that tastes really good when melted together. The classic and most popular version of the clusters includes a combination of chocolate and butterscotch chips. I actually prefer them made with a mix of bittersweet and semisweet chips and really well-salted peanuts. Fortunately, this is one of those recipes that you can play with. I'm going to give you the classic recipe, but I hope you won't remain tied to it. The big surprise here is that these really are delicious. Here's the recipe. 1) Line a cookie sheet with parchment paper. 2) Melt chocolate and butterscotch chips in top of a double boiler set over simmering water until creamy. Remove from heat. Stir in peanuts and coat well. 3) Drop onto parchment paper using a soup spoon. Place in a cool place to harden for about an hour. Store in a cool room or refrigerator. Yield: 2 dozen peanut clusters.